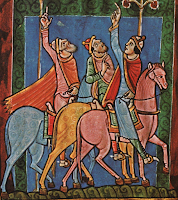 Magi journey - this time another illuminated page from a medieval manuscript - a fine example of the Norman art called Saint Albans Psalter - painted around 1130AD, for or at the Saint Albans Abbey. Believed to have been ordered by the abbot Geoffrey of Gorham for his friend an anchoress Christina of Markyate. The manuscript is kept at the Basilica Library at St. Godehard, Hildesheim, Germany. We see here no horseshoes (but they were in use as seen here or here), but they do appear in other XII century illuminations, the saddles have high arches and what appears to be some very colorful saddle blankets while the visible horse tack contains a breastcollar, bridle with a curb-bit and single pair of reins. Stirrups are long and our magi ride military style, holding reins with the left hand. 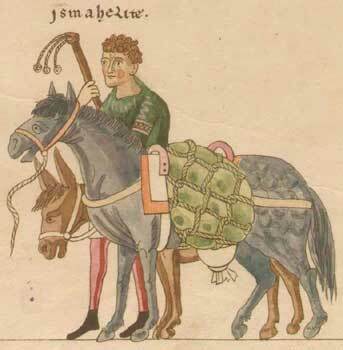 No crouper is visible, but there are perhaps two cinches, the rearone clearly visible with its buckle etc. 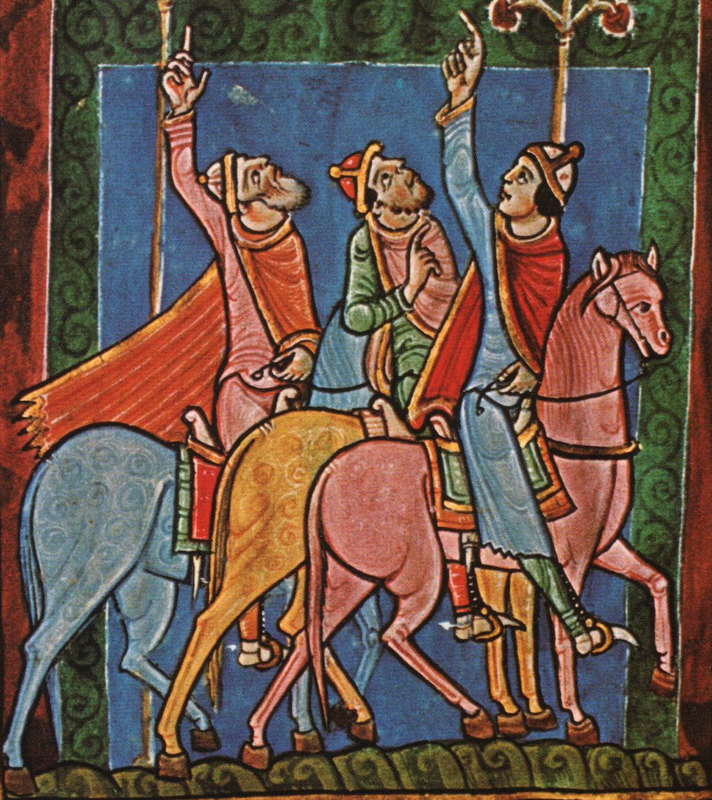 Siculo-Normans and Stauferian tradition in this manuscript by Petrus of Ebulo - lots of horses and also a sidesaddle-riding queen.